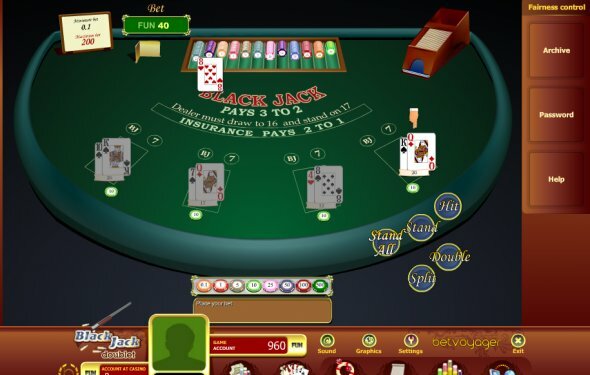 Applying the proper blackjack bankroll management system can make all the difference between having an enjoyable playing session or a disappointing playing session where at the end of it you are playing with limited money and you are unable to split hands or double up simply because you do not have enough money to cover the extra bets. One of the easiest bankroll management systems is the Single Session Bankroll Management. As its name would suggest this system applies for a single session of play that will include many rounds of blackjack. Before you start a session of blackjack you decide on a fixed amount of money that you can afford to lose playing. You buy chips to the value of your predetermined bankroll and select a table with betting limits that suit your bankroll. Another way to define your single session bankroll is according to time, by allocating a time frame in which you are allowed to play at a table with a table limit that is reasonable for your bankroll. Let us assume you want to play blackjack for the next two hours at an average of 20 hands per hour so the total number of hands you expect to play in the upcoming session is 40 and you plan on spending $5 per hand. 40 hands x $5 per hand = $200. However you might need to split hands or choose to double down on some hands so we would suggest that you add 20% to the $200 and start your playing session with $240. In case you hit a run of bad luck and lost your session bankroll you need to stop playing for at least a few hours, but we would advise that you stop playing for at least a couple of days. On the other hand if at the end of the two hours you are up on your initial investment you can continue to play using only your winnings. For example if you played for 2 hours using $240 bankroll and you find yourself up by $120 so your total bankroll currently stands at $360. Take the original $240 and remove them from play. Now you have $120 of the casino’s money to play with so even if you lose it you know that you will break even from this session as you already returned your original investment.